I have read about how they can change color, but is there literature about the chemical signaling process they use to do so? I read that it could be some combination of hormones and neurotransmitters, but I couldn't find specific information on the receptors or chemical mechanisms. 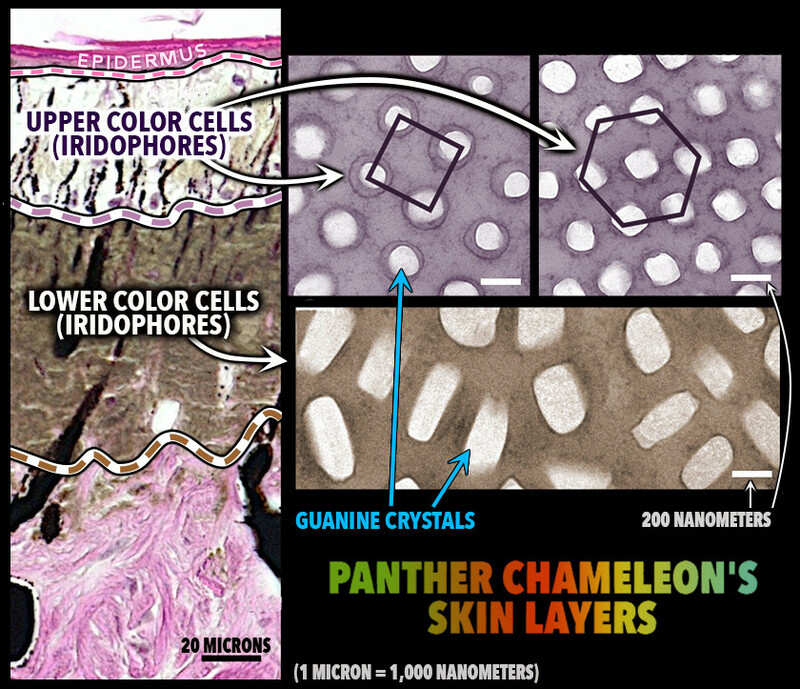 Chameleon skin has a superficial layer which contains pigments, and under the layer are cells with guanine crystals. Chameleons change color by changing the space between the guanine crystals, which changes the wavelength of light reflected off the crystals which changes the color of the skin. 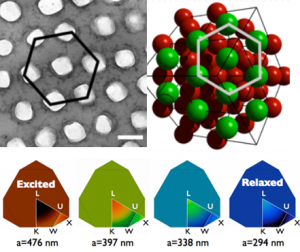 These guanine crystals are actually like colorless mirrors, but by changing the distance between these crystals, wavelength of light absorbed (and reflected) can be changed. It is quite similar to how the color of ozone changes from pale blue in gas to violet-black in solid form. However, how chameleons trigger this change in distance of crystals, is not yet known. You can also see a nice real-time video of guanine crystals changing color of chameleon here. superficial s-iridophores which help in changing color in visible region rapdily. deep d-iridophores which reflect light in infrared refion and are thought to provide thermal protection to chameleon. layer of melanin which is actually yellow in color, making chameleons naturally yellow(!) in color. When the guanine crystals come closer, they reflect the blue portion of visible spectrum. This blue light, along with the natural yellow color of melanin, becomes green which gives green color to chameleon. So, the actual color visible to us is a combination of color reflected by guanine crystal and yellow color of melanin. As I said already, the exact biochemical signalling process behind this process is not known yet. It could be complex hormonal or neurotransmitter signals. However, hormones are considered as the main triggers because chameleons have been shown to change color due to changes in mood instead of environmental protection. Cephalopods such as the octopus have complex chromatophore organs controlled by muscles to achieve this, whereas vertebrates such as chameleons generate a similar effect by cell signalling. Such signals can be hormones or neurotransmitters and may be initiated by changes in mood, temperature, stress or visible changes in the local environment. This is a good question and... kind of remarkable because I don't think there is a specific body of literature regarding chameleons. Generally though, vertebrate skin cells responsible for color (these cells are called chromatophores and arise from the neural crest during development) are responsive to the hormones melatonin, MSH, and others. These hormones, which are released from the pineal (melatonin) or pituitary (MSH), bind GPCRs on the surface of the chromatophores which elicit intracellular activation of PKA, for instance. This activity can cause mobilization of pigment within the cells. This article about fish coloration may help guide you somewhat in your studies, but chameleons in particular seem like an understudied clade of color-changing animals! Not the answer you're looking for? Browse other questions tagged biochemistry endocrinology cell-signaling or ask your own question. How quickly do estrogens break down in the environment? Are there U-rich transcriptional pause sites? How are Thyroid Stimulating Ab destroying thyroid tissues?